Bitcoin seeks to be an electronic cash (currency) system that doesn't rely on trust. Paradoxically, Bitcoin requires a trust-based ecosystem. As a brief summary: The Bitcoin system was developed as an electronic currency by Satoshi Nakamoto (apparently, a pseudonym). Bitcoins exist only in the online world (they have no physical form). Each Bitcoin is uniquely identified, and is part of a limited edition (only a pre-set number will be issued). And, if properly executed, Bitcoin transactions are anonymous and non-reversible. For a more detailed explanation of Bitcoin's architecture, see Benjamin Wallace (Wired) or The Economist. Trust the willingness of counterparties to accept Bitcoin as currency for payment -- a huge leap of faith. Purchasing Bitcoins means participation in a 100 percent trust-based system, without any legal mechanism to compel their acceptance. Conventional currencies rely not just on trust, but also on the force of law. For example, in America the "Legal Tender Statute" (31 USC Sec. 5103) specifies that: "United States coins and currency ... are legal tender for all debts, public charges, taxes, and dues." No country issues Bitcoins, and no government legally compels anyone to accept them as payment. Trust a cryptographic, peer-to-peer network computer technology most Bitcoin users don't understand. Trust that Bitcoin (really, a beta) won't be replaced by a superior digital currency system, rendering original Bitcoins obsolete and worthless. Trust that the Bitcoin Foundation/other participants won't create additional Bitcoin series, thereby diluting the value of the original Bitcoins. Trust that governments won't intervene to render Bitcoins worthless (e.g., if Bitcoins facilitate too much drug-dealing or money laundering, the U.S. government could make their possession illegal). Trust an anonymous creator (Nakamoto) who's mysteriously "moved on to other projects" and disappeared. Trust that Bitcoin markets will be available to provide prices in real currencies -- as recent events demonstrate, also a leap of faith. Trust that your Bitcoins are stored in a secure location. Precisely because Bitcoin transactions are anonymous and non-reversible, they're highly vulnerable to theft. If your Bitcoins are stolen, they're pretty much untraceable. For a non-exhaustive list of major Bitcoin theft incidents, click here. Rather than as currency, perhaps we should evaluate Bitcoin as the first example of Dadaist Digital art. An art work exists as part of some limited edition and has no intrinsic use. If you purchase art (for financial reasons), you must believe/trust that members of the art ecosystem will value/be willing to purchase that work at a future time. an ... international movement ... repudiating and mocking artistic and social conventions and emphasizing the illogical and absurd. 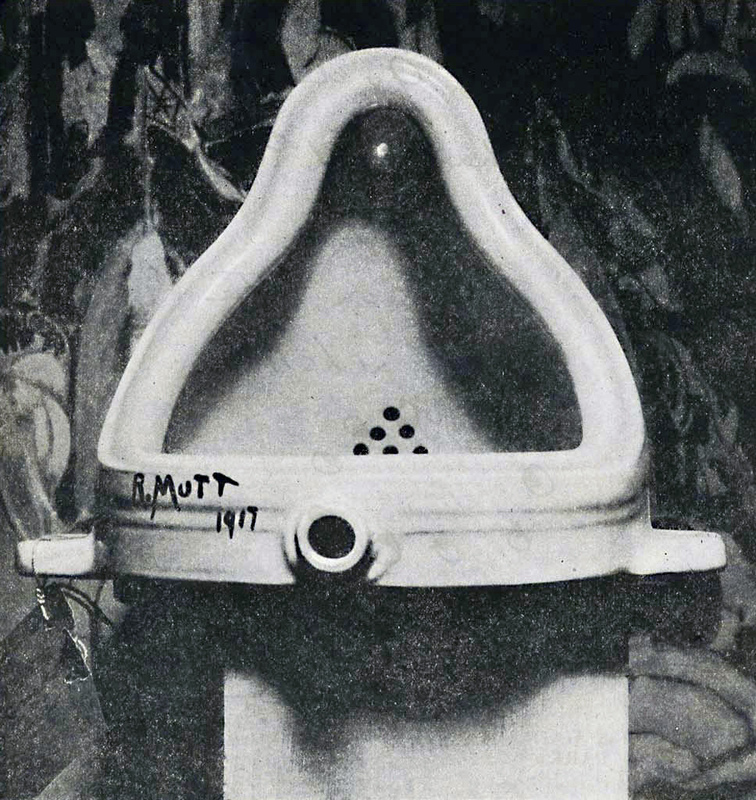 One of Dadaism's first major works was Duchamp's Fountain (created under the pseudonym R. Mutt). As shown below, Fountain is an off-the-shelf, mass-produced urinal. The urinal designated as Fountain, however, had considerable value. Replicas, authorized by Duchamp, have sold for over $1 million each. Duchamp made an important artistic statement with Fountain; but on another level, he created an intellectual joke about the nature of art. Nakamoto, in "Bitcoin: A Peer-to-Peer Electronic Cash System" and other writings, makes important observations about cryptography, currency and the nature of trust. Bitcoin's design is highly significant and will likely influence payment systems for years to come. However, Bitcoin's implementation feels like an elaborate intellectual joke. Under the guise of eliminating the need for trust, Nakamoto demonstrates that trust is an inescapable part of payment systems. Is Satoshi Nakamoto the Duchamp of our Digital generation? Bitcoin's inventor seems sophisticated enough to understand that, as currency, Bitcoin's long term value might be zero. But analogous to Duchamp's Fountain, Bitcoin might be intellectually priceless -- for the issues it highlights (or as the first example of Dadaistic Digital Art).